Charles is calling the USA an outpost? Well, buddy, enjoy your new daughter-in-law!!!! LOL!!! Does outpost mean a colony? Charles should not make political statements. It is hysterically funny that a man like Charles who leaves carbon footprints gets all high and mighty about the environment. He even sent a jet back to the UK to bring some knick knack to him when he was on tour. He is a complete waste in his position as his father knows and reminded him constantly. So even though he is creepy, weird, obtuse, lizard-like, etc. I feel sorry for him on some level. Although not sorry enough to keep that duchy income in his crepe like hands. He can bad mouth Trump all he wants, it will fall on deaf ears. Trump would have Chuck for bird feed if they ever had a confrontation. ^^ If Charles cares so much about the environment, he should ride a bicycle to his appearances. Only use cars for long distances and always carpool (bus, economy class flights). No more private jets or first class flights. The Prince of Wales and Duchess of Cornwall will visit Australia, beginning their engagements in Brisbane on Wednesday 4th April. His Royal Highness, accompanied by The Duchess, will represent Her Majesty The Queen at the opening of the XXI Commonwealth Games, reading out Her Majesty's customary message, calling on athletes to come together in the spirit of friendly competition. Their Royal Highnesses will visit Brisbane & the Gold Coast together; before His Royal Highness continues his visit to Queensland and the Northern Territory, concluding on Tuesday 10th April. The Prince of Wales will visit Vanuatu on Saturday 7th April, where his programme will include learning more about the reconstruction which has taken place following the devastating impact of Cyclone Pam. His Royal Highness will highlight the challenges faced by Island States vulnerable to the growing threat of climate change, as has been most recently demonstrated by the dreadful effects of Cyclone Gita in Tonga. I agree with you, Sandy. By no means am I a fan of Meggy Marbles, but she shouldn't be blamed for anything, especially after Camilla and the Middletons were let in. Meg's antics pale in comparison. That said, even if she is allegedly the one to topple the monarchy, good for her. This whole wretched lot needs to GO. The ones to topple to monarchy are The Viper and The Potato Head for what they have done THREE TIMES. NOT ONCE BUT THREE TIMES. Their actions are reprehensible beyond belief. Their actions are flat out TREASON. Go to the Members Only section to be enlightened if you have been living in the dark for the past few years. ^Wouldn't surprise me one bit if they do it a fourth time. ^^^^ Metro's got the headline of the year surely! But Clarence House said it was removed because the public was no longer interested in the issues. It's quite bad when the other 2 women linked to he prince's can fi with that quote. What's the need for her to be Queen? What's wrong with Charles that he would want that? If his dad could be ok being Prince Philip and not king consort to the queen, then he should be satified with Camilla being his consort. Could MM's presence help soften the public to Camilla. It's odd because the related articles has 3 articles on MM. Articles about Camilla helping sooth MM's pre-marriage nerves and singer er praises at the engagement announcement have been odd too. 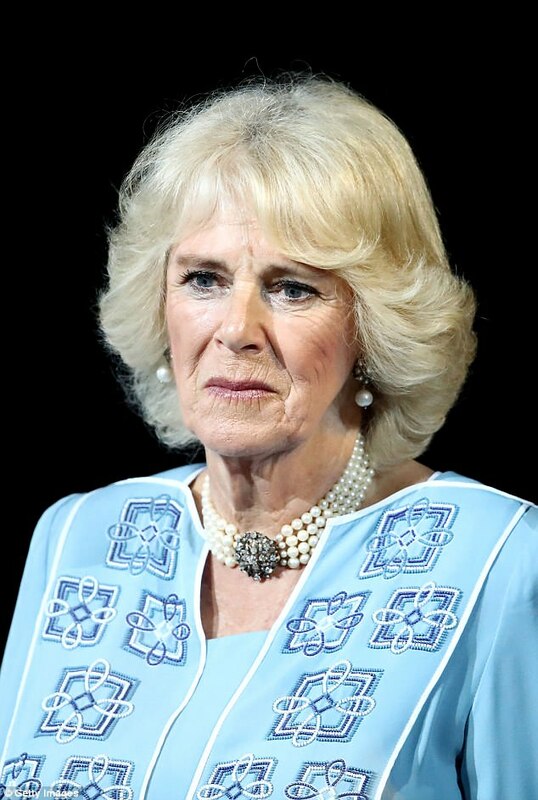 Camilla will be Charles' consort whatever title she has. In the UK there is no such thing as a morganatic marriage. That was established in 1936 when Edward VIII asked if Wallis could have a title other than Queen Consort if she was his wife and he was told 'no'. Any attempt to strip Camilla of the style of Queen would therefore mean that Edward was given the wrong advice in 1936 and that a morganatic marriage is possible in the UK. In order to introduce that concept thought the British parliament and those of the other realms would also have to pass the necessary legislation to introduce that concept which they may do but I doubt that any of them would agree - and certainly no woman could possibly agree that a woman has to be seen as inferior to her husband in this day and age - when women have been pushing for equality to then turn around and so 'no we have to have legislation that says that xxxx woman isn't equal to her husband'. I think this is just Camilla promotion as the next "Mother Theresa" and nothing to do with MEghan. LOts of nonsense. Camilla made a darn fool of herself taking Kate out to give her "advice" loudly giving her instructions "let me tell you something." She did not even give birth or mother WIll and Harry she should look to her own children especially her son whose marriage is on the rocks. The protest on the Gold Coast. These are aboriginal protesters who want PM Turnbull to establish a Truths Commission. This has been going on for some time. Charles and Camilla got large and enthusiastic crowds out to greet them. However, at the ceremony (and I watched it last night, it was great) Charles looked a bit solemn but nothing out of the ordinary. Cam didn't look happy to be there. Diana was greatly loved by Aussies and so the Twitter sentiments telling 'adulterers to get lost' etc isn't a surprise to me, actually. The crowds may have been large but I can't see anybody being enthusiastic about those two except ardent royalists. 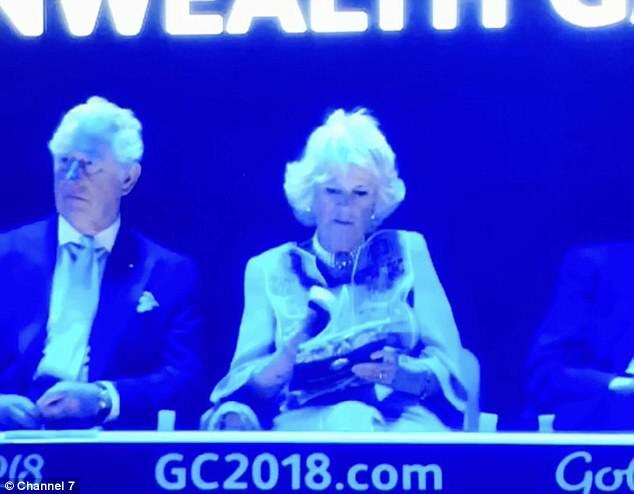 I don't think she's going to score points with the Queen for her looking bored and sulky. Maybe she and Charles are having issues and maybe she did not want to do the tour. Seems like passive aggression to me.